At COTS, we are committed to helping our families, veterans, and adults to rebuild their lives. Out of respect for clients’ dignity and self-worth, we request that all donated items be in good to excellent condition. Please note: We are currently only able to accept items listed below. All donations are tax deductible. Donated items which are not needed may be exchanged or donated. We ask that item donations be brought to the Mary Isaak Center Tuesdays, Thursdays, and Saturdays, 2-5pm. If you have an item not on this list to donate please see below before bringing it in. If you have questions, please call Angela Pustorino, Development Associate, at (707) 765-6530 ext.103, or email apustorino@cots.org. Gift Cards: Gas, groceries, Target, Payless Shoes, haircuts, etc. At the moment, we cannot accept any more clothing, as we are overwhelmed by your generous donations over the holidays! We also cannot currently accept furniture or other large items, though please check back regularly as we will post needed items as they come up. Thank you for your generosity and for supporting COTS! Looking to donate as a group or put on a drive? COTS is looking for welcome home baskets for clients moving into permanent housing. If you are interested in donating with a group or organizing a drive, this is a great way to give to our clients! You can find a list of items needed for welcome home baskets and starter food kits by clicking here. Please bring all food donations to the the Mary Isaak Center at 900 Hopper St. in Petaluma, Monday through Thursday, 9am-12:30pm. Food donations may be brought directly to the roll-up doors at the south side of the building. We accept what is on this list OR food prepared in a professional kitchen. Canned goods, including fruit, veggies, diced tomatoes, etc. If you have food items to donate other than what is on this list, or would like to conduct a food drive, please do so via the Petaluma Salvation Army Corps at 721 S McDowell St. in Petaluma, Monday through Friday, 9am-12pm. Or, if you have questions about food donations, please call Derrick Ng, our Food Services Associate, at (707) 765-6530 ext.131. Mary’s Kitchen at the Mary Isaak Center is dedicated to bringing our community healthy, fresh food on the daily. If you run an organic farm or grow your own organic produce and are interested in donating fresh produce to us, please let us know! We would love to connect. 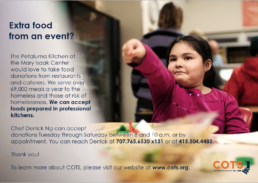 Please call Derrick Ng, our Food Services Associate, at (707) 765-6530 ext.131.